We love hummus at Go Natural. It is a versatile, healthy and easy dip to make. This version of hummus is such a great colour that it would be perfect for Xmas party fare. The great recipe is courtesy of Nutra Organics and uses their bone broth (or vegetable broth) as a flavour enhancer and a wellness boost. Just the thing you will need socialising during the festive season. Peel and cut beetroots into 2cm chunks. Add a little coconut oil to the beetroots and roast for about 30 mins. Once cooked set aside to cool for 10 mins. 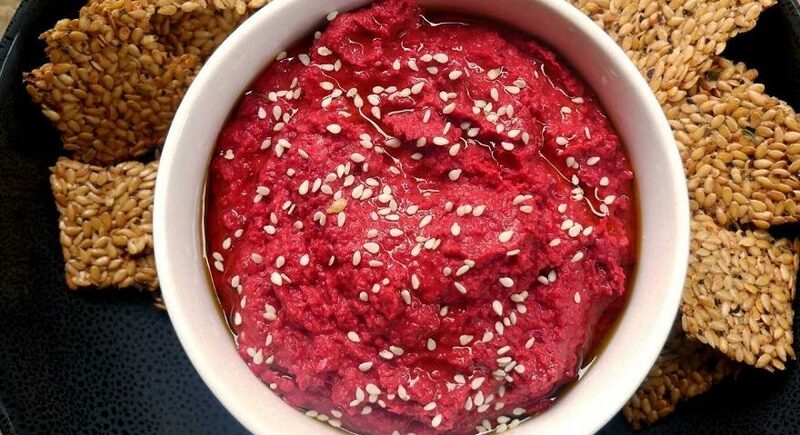 Place roasted beetroot into a high powered blender and blend until a paste. Add all the other ingredients and blend for about 1-2 mins to combine and become smooth. Sprinkle with sesame seeds, some goats cheese and your favourite gluten free seed crackers….